Thumbing through a beauty magazine or a luxury resort brochure one will probably see the serene image of a recumbent woman wearing a pristine robe and artfully wrapped towel turban, her face slathered in a luscious cream mask with perfectly shaped cucumber slices carefully positioned over her eyes. But is there more to this iconic image of spa luxury and blissed-out relaxation? Many antiaging formulations feature cucumber extract to help bolster claims that include hydrating, skin lightening, pore tightening, and wrinkle reduction. These benefits are due to cucumbers’ relatively high levels of skin-loving nutrients, such as potassium, magnesium, vitamin C, vitamin K, caffeic acid, and antioxidants, that counteract the skin-aging effects of ultraviolet rays, HEV rays, and environmental pollutants. The challenge is using the appropriate technology to deliver those molecules into targeted areas to counteract signs of skin aging. However, obtaining a wide range of benefits like this from a solitary cucumber slice is unlikely. 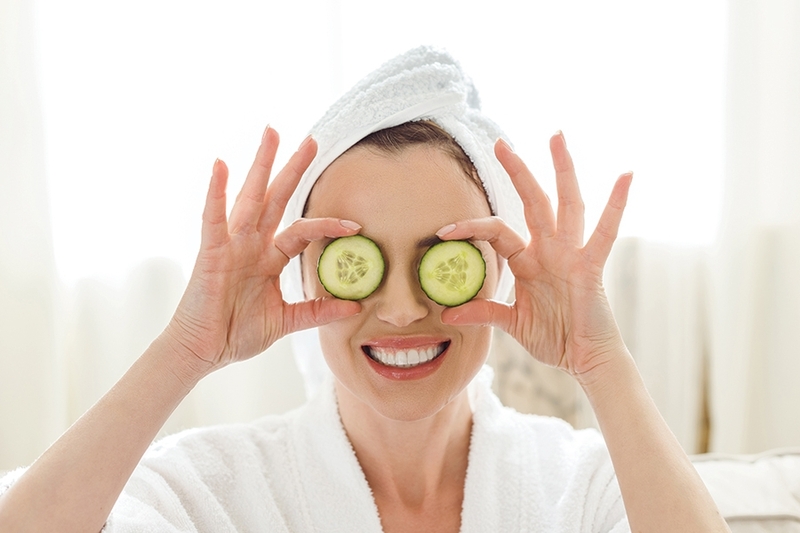 Science does support the claim that chilled cucumber slices reduce undereye puffiness and swelling. The key word here is “chilled.” What happens if the cucumber is not chilled? Not much. It is the cool temperature and high water content of a chilled cucumber slice that provide the soothing, de-puffing benefits. When the skin is cooled down, swollen blood vessels constrict, slowing blood flow and reducing the excess fluid that causes puffiness and inflammation. Cucumbers consist of over 96 percent water and when placed over the eyes, cucumber slices give off water that evaporates at room temperature, relieving inflammation and irritation. But, is a cucumber necessary? A cold compress over the eyes could provide similar benefits. 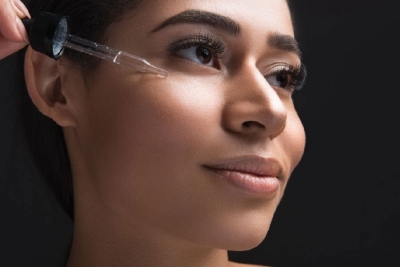 Why not go a step further and consider the selection of effective eye creams that contain a team of peptides, amino acids, vitamins, antioxidants, and natural botanical extracts to soothe, de-puff, brighten, firm, and lift the eye areas? Beyond using chilled cucumber slices as a vehicle for de-puffing and soothing, look for cucumber extract in skin-soothing, antiaging masks. But why stop there? Strawberry extract contains collagen-boosting ellagic acid. Raspberry extract provides strong antioxidant protection against ultraviolet and HEV rays. Black currant extract is rich in omega-6 fatty acid for enhancing elasticity. Avocados provide mega-moisture and diminish inflammation. Pumpkin has beta-carotene, vitamin A, vitamin C, and zinc to clarify, brighten, and counteract premature signs of aging. Bottom line? Puffy eyes, irritation, and swelling are caused by two specific culprits: compromised blood flow and fluid retention. Chilled cucumber slices boast hydrating and cooling properties that really can soothe and reduce swelling – but as a quick fix. And, the refreshing smell and feel may be attractive for individuals in search of a healthy, pampered spa experience. Still, for long-term benefits, look to cooling eye masks that also include advanced and effective antiaging ingredients and do not underestimate the value of beauty sleep.